Few travellers can afford consistent bookings at five star hostels throughout their gap year, much less the luxury of five start hotels. Yet the beauty of a gap year is the number of adventures it can offer, from sleeping tight under a downy duvet to sleeping out under the stars. Camp site accommodation is a popular alternative with travellers looking for not only a unique experience, but to save a little bit of money as well. Camp site accommodation may be basic, but it is also usually cheap, clean and safe. Just don't scream when you realise you'll be sharing your shower - with the local wildlife, that is! The definition of a campsite may vary from country to country, or even region to region. At their most basic, campsites are designated areas, most often with facilities such as toilets, sinks and showers, where visitors can sleep in their own tents. More luxurious campsites may also include caravans (mobile homes), cabins or chalets as well as pools, community squares and discos. Some campsites may offer meals on request, laundry facilities and even small grocery shops. More amenities, however, are usually reflected in a higher price. How Do I Book a Campsite Accommodation? UK Student Life for campsites in the UK and Europe. Australian Explorer for campsites across Australia. Camping Go for campsites across the United States. E Camping Directory for campsites across the world. Trav.com Campsites for campsites worldwide. How Do I Stay Safe While Staying at a Campsite? 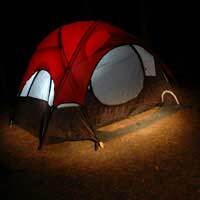 Staying safe at a campsite simply requires common sense. Keep your valuables locked in your luggage, leave jewellery and other easily stolen items at home, and keep your wallet/purse on your person at all times. Never leave bags unattended in your accommodation, and do not watch bags for strangers. Alert the site authorities to suspicious behaviour by other guests, and never wander alone after dark. Follow all camp site rules, particularly those regarding fires and noise, and display all of the courtesies you would expect your fellow travellers to extend to you. Campsite accommodations are a cheap and safe way to spend a few nights during your gap year. Seasoned backpackers will extol the virtues of campsites across the world, and no doubt you will return home with a few favourites of your own. Remember to verify that all campsite accommodations you expect to use are licensed and in good standing with a national camping association, and use your own good sense to stay safe. Good luck!